Bicycling magazine is lauding us for building protected bike lanes, lowering vehicle speed limits and opening up the streets to private, stationless bike-share companies. We ranked fifth on the same list in 2016. Everybody always thinks they’re losing in Seattle’s bicycle battles. Ask the furious bike haters: Bike lanes are to blame for worsening traffic. And for the lack of parking. Police were called in after fireworks were found in construction equipment at a controversial bike-lane project in Northeast Seattle. Ask angsty cycling advocates: The 4th Avenue bike lane is delayed. The mayor has poured cold water on a downtown bike network anytime soon. Bicycle commuting is down. But, if you take a step back, Seattle is actually doing pretty well by bicyclists, at least according to one less-than -scientific analysis. Bicycling magazine recently named Seattle the best bike city in America, lauding us for building protected bike lanes, lowering vehicle speed limits and opening up the streets to private, stationless bike-share companies. San Francisco comes in second, according to the magazine, and Fort Collins, Colorado is third. Seattle ranked fifth on the same list in 2016. The cost of some of Seattle’s new bike facilities has both raised ire and led to debates on how much of that cost should fairly be attributed to bike lanes, or represents just general street upgrades. But we do have some nice, new, bike lanes and paths. “Very few bike lanes in the country are being built with the attention to detail that engineers in Seattle are using,” Bicycling magazine wrote, citing the new Second Avenue bike lane and the Westlake Avenue bike path. The magazine credited the city with building the Second Avenue lane with bike-specific traffic lights, planters and concrete dividers to separate bikes from car traffic, and even noted the rails at intersections for cyclists to lean on when they’re stopped. The magazine rated cities based on safety — using metrics like cyclist deaths and speed limits — bike-friendly infrastructure, biking enthusiasm and bike culture. Enthusiasm was judged by, among other things, how much bike-friendly legislation is passed. 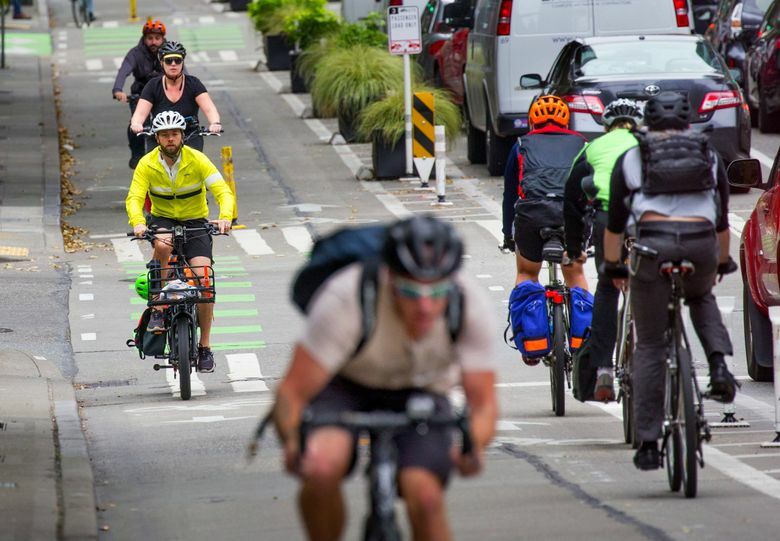 So Seattle gained points for things like passing the Move Seattle transportation levy, which funds bike projects, and for the City Council’s passage of a nonbinding resolution calling for a network of connected downtown bike lanes. Portland, which traditionally rates near the top of such lists and has a bike commuting rate that’s more than double Seattle’s, ranked fifth on Bicycling magazine’s list. The city was faulted for building far fewer protected bike lanes in the past few years than peer cities, like Seattle and San Francisco.